Oklahoma City point guard Russell Westbrook has suffered a slight cartilage tear in his right knee and a surgical procedure in the next 48 hours will determine the possibility of his return before the end of the playoffs. Westbrook suffered the tear of his lateral meniscus in the second quarter of Game 2 of the Thunder's first-round playoff series with the Houston Rockets after Rockets guard Patrick Beverley lunged at Westbrook to make a steal as the Thunder guard signaled for a timeout. Westbrook is "irate," with Beverley, a league source told Yahoo! Sports. The meniscus tear is considered to be minimal – perhaps 2 percent of the meniscus, one source said – and Westbrook's recovery could be weeks instead of months, if the doctor decides to simply "clean up" the meniscus. A full repair of the meniscus would likely mean a three-month recovery for Westbrook. The Thunder and Westbrook don't want to risk anything with the long-term stability of his knee, sources said, and aren't pushing for the short-term solution over the longer-term procedure. Westbrook, 24, is an All-Star and one of the league's top point guards. His absence is a severe blow to the Thunder's chances of repeating as Western Conference champions. 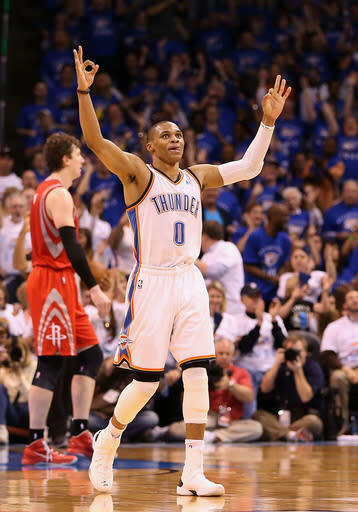 The Thunder hold a 2-0 series lead over the Rockets, with Games 3 and 4 moving to Houston on Saturday and Monday. Westbrook has never missed a game in his five-season NBA career, playing in a possible 439 of 439 regular-season and playoff games. He averaged 23.2 points and 7.4 assists during the regular season and is averaging 24 points and seven assists in the two games against the Rockets. Los Angeles Lakers forward Metta World Peace suffered a meniscus tear in his left knee last month and was initially projected to be sidelined for six months. He instead returned in less than two weeks after surgery.